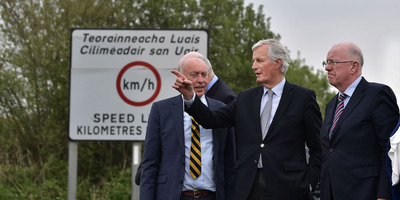 Charles McQuillan / GettyThe European Commission’s chief Brexit negotiator Michel Barnier (C) points towards the north as he is accompanied by Irish Foreign Affairs Minister, Charlie Flanagan (R) as they walk along the border separating Northern Ireland and the Irish Republic known as Concession Road on May 12, 2017 in Monaghan, Ireland. 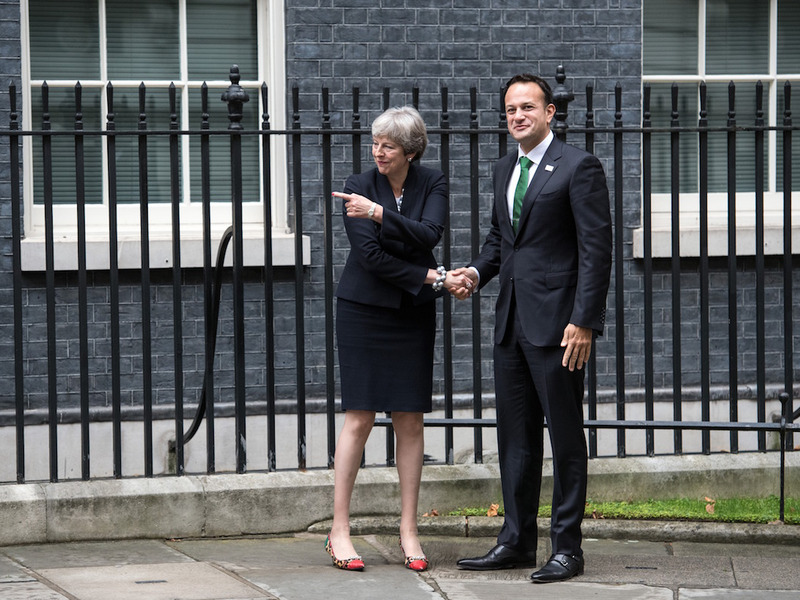 Theresa May’s plan to avoid a hard border between north and south Ireland will be “very, very difficult” to achieve, experts have told Business Insider. The Irish border issue barely featured in the EU referendum campaign, but it has rapidly become one of the most difficult issues in Brexit talks. Leaving the EU’s customs union means a hard border will be very difficult to avoid, and experts speaking to Business Insider cast doubt on the idea that a workable solution currently even exists. 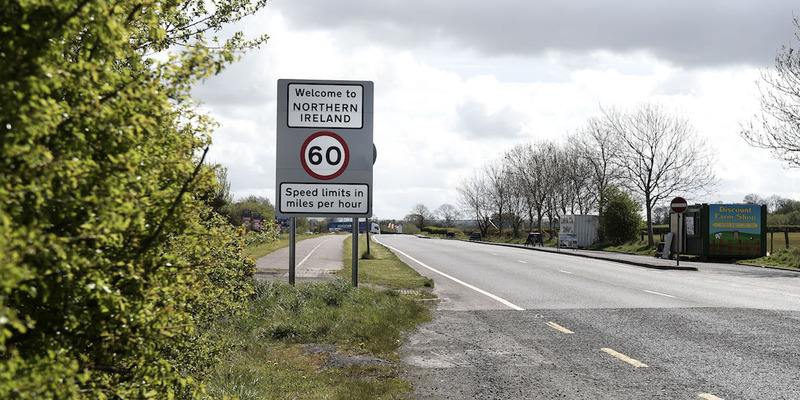 LONDON – Theresa May’s plan to maintain a “frictionless” border between north and south Ireland after Brexit will be “very, very difficult” to achieve, experts have told Business Insider. The UK has committed to avoiding a hard border between Northern Ireland, which will leave the EU along with the rest of the UK, and the Republic of Ireland, which will remain in the EU, and the stakes could not be higher. Failure to do so risks undermining the terms of the 1998 Good Friday Agreement, which brought peace to the island after three decades of sectarian violence. But the UK’s decision to leave the EU’s customs union means a hard border will be very difficult to avoid, and experts speaking to Business Insider cast doubt on the idea that a workable solution currently even exists. Why will there need to be a border? 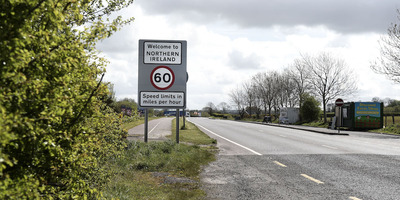 Charles McQuillan / GettyA welcome to Northern Ireland road sign signalling the crossing of the border between north and south can be seen on May 4, 2016 in Ireland. At present there are no checkpoints in place for anyone crossing this border, either by foot or vehicle. At present, there are no checks of any description between the Irish border, either on land or foot: The Good Friday Agreement made it invisible. Both the UK and Ireland want to keep it that way, but Theresa May has a problem. She has repeatedly said the UK will leave the EU customs union after Brexit, which allows the free movement of goods between EU member states. Being outside the customs union – one of May’s so-called “red lines” – will give Britain the ability to strike free trade deals independently, rather than being bound by EU rules. But having a different customs regime to the EU also suggests there will need to be physical infrastructure and checks at the border in order to counter smuggling efforts and enforce basic international trade law. The EU is highly unlikely to compromise on that issue. “The EU is an entity based on legal certainty and upon certain principles,” Hayward told BI. “It has to be very clear about the rules. Those rules have to be very clearly defined, especially at its external boundaries. They have to know what rules apply and certainly in relation to customs. That’s unambiguous,” she said. 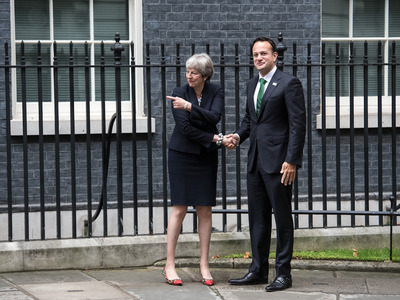 Carl Court / GettyTheresa May greets Ireland’s Taoiseach, Leo Varadkar, as he arrives in Downing Street on September 25, 2017 in London, England. But Hayward said technological solutions would not remove the need for checks at the border. “The emphasis upon technological solutions is almost a category error, because technology is a tool, not a solution,” she said. That extraordinary claim would – if implemented – mean both the UK and EU flouted the most basic principles of international trade law. It implies that goods should be able to flow unchecked into the EU’s single market – an extremely well-protected free trade zone – simply because they were being traded by small-sized businesses. “They’re essentially saying they’re just going to ignore the fact it’s a customs border,” she said. “No wonder the EU is rolling its eyes at that. You have to make it possible for anybody wanting to trade across that border and move goods across the border, and make it possible for them to do so in a legal way,” she said. Could Ireland have a border like Norway’s and Sweden’s? Prominent Brexiteers including Labour MP Kate Hoey and journalist Andrew Pierce have suggested a hard border could be avoided by using technology similar to that used at the Norway-Sweden border. Sweden is a member of the EU, but Norway is not. So could a similar arrangement work in Ireland? It’s unlikely, for two crucial reasons. “There’s one thing everyone tends to forget with the Norway-Swedish border. Norway is part of the European Economic Area and Schengen,” said Custom Connect’s Paul Verrips. Norway’s membership of the EEA means it is a member of the single market, which allows for the free movement of goods in return for Norway signing up to many of the EU’s rules – something the UK is not willing to consider. Its membership of Schengen, meanwhile, allows for the free movement of people, meaning immigration checks at the Norway-Sweden border do not need to be rigorously enforced. The UK has also committed to ending the free movement of people after Brexit in a bid to slash immigration. For as long as the UK refuses membership of those, the comparison does not stand. What about the US-Canada border? 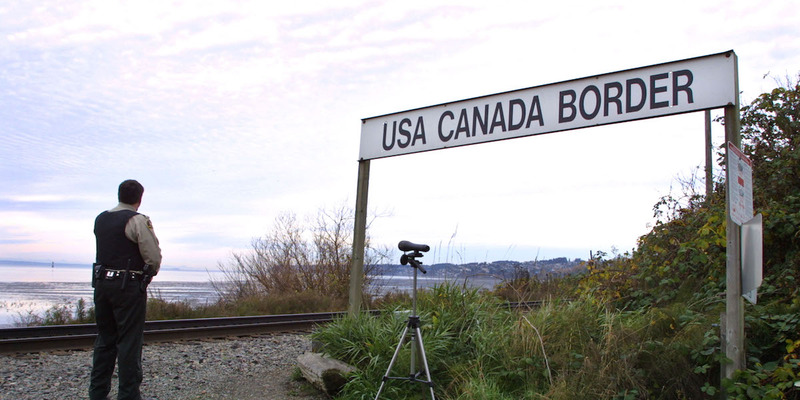 Jeff Vinnick / GettyA Canadian Customs and Fisheries officer watches over the U.S.-Canada border between Blaine, Washington and White Rock, British Columbia November 8, 2001 in White Rock, BC. Reports emerged last week that Theresa May was looking to the USA-Canada border for solutions in Ireland. Many, including Irish premier Leo Varadkar, were quick to point out that the border is anything but frictionless. There are armed guards with dogs, boat patrols, customs officers, and lengthy customs checks at the border, and Northern Ireland immediately rejected the prospect. The best solution would be May redrawing her “red line” and staying in the customs union, Hayward said. Failing that, the UK could follow the EU’s “back-stop” suggestion and keep Northern Ireland in the EU customs territory after Brexit. But Hayward said Northern Ireland already has a unique regulatory arrangement, and said an ambitious free-trade deal would determine whether there were significant barriers between the UK and Northern Ireland. “The idea that the constitutional integrity of the UK is at risk if you include bespoke arrangements for Northern Ireland is wrong-headed,” she said. “The whole 1998 Good Friday Agreement and indeed the existing position of Northern Ireland, with its particular devolved situation administration means it already has a unique level of governance. Whatever the solution, Paul Verrips said the UK is running out of time. The UK is scheduled to leave the EU in March next year and will likely enter into a transition phase which lasts only 20 months before it leaves fully. Britain has so far been successful in avoiding any attempts to commit to a single solution on the Irish border, but the fudge is unlikely to last much longer.